Food and wine... two of life's great pleasures. Italians proudly count themselves among the world's greatest cooks. The rolling hills of Tuscany provide the main ingredients for the traditional rustic style of cooking used by the locals. Tuscan olive oil is considered to be some of the finest in the world. Combined with the regions luscious tomatoes, exceptional cheese, crusty breads and select wines, Tuscan cuisine will please the toughest critic. It is said that more soil is used in Italy for the cultivation of grapes than for the growing of food. Today, Tuscany is one of the most famous and prolific wine regions in Europe. Pairing a glass of fine Tuscan wine with a delicious traditional meal completes the Tuscan experience. If you enjoy cooking and want to perfect your skills or if you are happy just to taste great Italian food, consider our food-inspired tours. 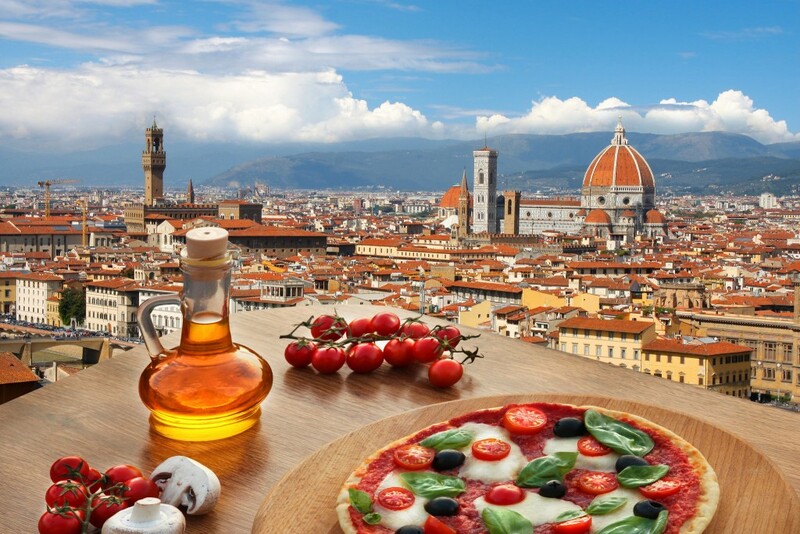 Below is a suggested tour that draws on the hearty cuisine of the Tuscan hills. We can customize a tour for you to satisfy your appetite. You will be privately transferred to your hotel. Afternoon at leisure to explore the beauty of Florence. After breakfast, enjoy you small group cooking tour and learn to cook like an Italian. You will visit the central food market with your chef to select the freshest ingredients. After shopping, you will prepare a full Italian meal from appetizer to dessert. After preparing bruschetta as a starter, learn to make fresh pasta and sauce, a main course as well as dessert. Then reap the rewards of your efforts—lunch consisting of the delicious dishes you have created accompanied by a local wine, water or soft drink. Mangia! The remainder of the day is at leisure. After breakfast, meet you guide to begin your walking tour of Florence, the birthplace of the Renaissance. Visit the gems of Florence: Piazza della Signoria, Palazzo Vecchio, the Duomo and Giotto’s bell tower, Ponte Vecchio and the Accademia Museum to see the David. The remainder of the day is at leisure. Enjoy a full day of culture, wine and delicious food as you visit some of the most spectacular towns in Tuscany. Visit Siena, Pienza, Montalcino and Montepulciano to experience art and culture and to sample local wines and cheeses. Begin in Siena with a guided tour of this exquisite walled city. Continue to Montalcino for a visit to Brunello di Montalcino for a wine-tasting and delicious snack of local products. You will then visit the town of Montalcino, a typical Tuscan village. After you will visit Pienza, to sample Pecorino cheese, and then continue to Nobile di Montepulciano for a final wine-tasting. Return to Florence. After breakfast, enjoy another cooking class in central Florence. Today’s menu is pizza and gelato! Meet the chef and learn to make the original Italian pizza step by step including the correct way to knead and stretch pizza dough. Then you learn the secrets to making Italy’s yummy gelato. Finally, taste the fruits of your labor. The remainder of your day is at leisure. Tonight take a guided 45-minute sunset walking tour in the heart of Florence. You will learn about the Italian culture, its highly-acclaimed cuisine and way of living. After the walking tour, you will dine at a local trattoria where you will enjoy a 3-course meal (drinks and gratuity not included). Enjoy a day of leisure in the fabulous city! You will be privately transferred from your hotel in Florence to the airport. Consider adding a "foodie" tour in Rome! It can be added before or after Florence! Day 8-11: Add-on a Rome Food Tour! Day 1: Rome You will be privately transferred to your hotel. Remainder of the day at leisure. Tonight take a guided 45-minute sunset walking tour in the heart of Rome from Via Veneto to the Spanish Steps. You will learn about the Italian culture, its highly-acclaimed cuisine and way of living. After the walking tour, you will dine at a local trattoria where you will enjoy a 3-course meal (drinks and gratuity not included). Day 2: Rome – Tasting Tour - daily except Sunday. After breakfast, join a local food connoisseur guide and stroll Rome’s enchanting squares and neighborhoods while tasting your way through some of the city’s best shops, restaurants and markets discovering first-hand the secrets of Italian cuisine. Enjoy pizza with mortadella, suppli (fried rice balls) and pasta. Then explore the Jewish ghetto food specialties—fried artichokes and fried codfish. Savor an artisanal gelato tasting alongside tips and history of Italian food. Day 3: Rome – Pizza Making Class - Offered daily except Saturday & Sunday After breakfast, remainder of the day at leisure. This evening your pizza making class is held at a local restaurant near the Trevi Fountain. A chef will guide you through the Italian tradition of preparing pizza dough from scratch and teach you how to “dress” your pizza properly. You can choose from a variety of ingredients for topping your pizza and experiment with various recipes. Enjoy your creation along with wine, water, soft drinks and dessert. Day 4: Rome You will be privately transferred to Rome Airport.